Have you been looking out of the corner of your eye and wondering what the heck I’m doing with Best Day Ever? Well, Bramble Berry enriches lives by empowering creativity, and I think that you do your best by feeling your best. After all, creativity comes from body and soul. So, I’ve got just the thing to get that body and soul in line with your most creative selves. 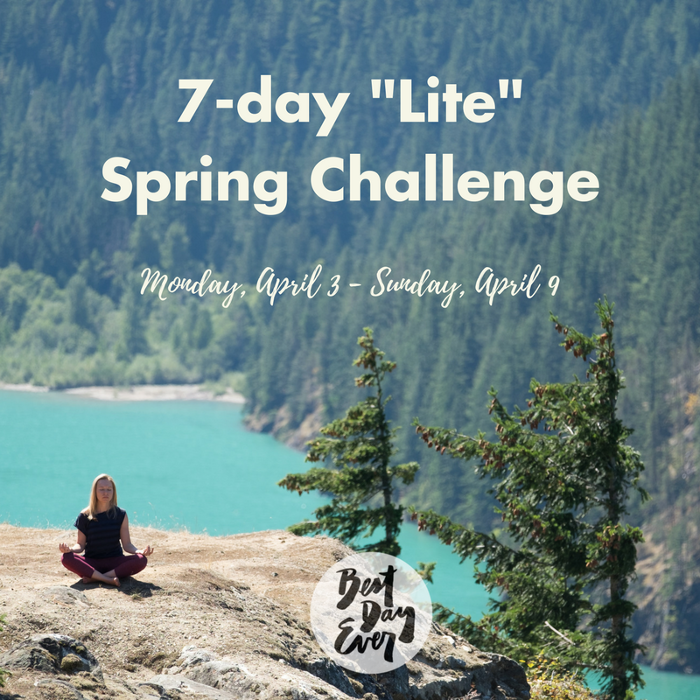 I kept hearing that the full 42-day challenge seemed long, intimidating and a constricting, so I designed a challenge “lite” to introduce you to the Best Day Ever way of eating, moving, and sleeping without a huge commitment: a mini 7-day challenge. It starts Monday, April 3rd. It’s a chance for you to explore the concept, post what you’re eating, and enjoy the camaraderie of people all learning together. Best yet? If you like it and want to dive deeper, you can apply the $10 entry fee to the 42-day challenge. What’s different about “lite” vs a “full” 42-day challenge? A lot actually. This is a starter challenge just for you to see if this is something you want to try. The full challenge gets daily educational emails, a recipe book, an online check-in system, and a private blog. The Challenge Lite is a Facebook check-in group with a Best Day Ever shopping list, accountability component with daily check-ins, and education posted in the Facebook group. It’s meant to introduce you to us and the Best Day Ever way of eating. And, if you like it, you get the full $10 entry credited toward the 42-day challenge. Is this just about what to eat or does this involve other activities as well, such as excersize or meditation? What type of foods? Raw whole, gluten free? Thanks Dawn. I am very interested, but have never seen any recipes posted. Do you have a sample of anything or short list of foods that are okay to eat? I have many restrictions and hesitate to sign up for something I may not be able to participate it. Adequate rest – This might not be 8 hours, but it’s most likely more than you’re doing now. Seven hours of uninterrupted sleep is ideal. Limited alcohol – Yes, this is a tough one for many type-A personalities and social butterflies but alcohol slows down our metabolism and disrupts our sleep, making us foggy the next day. You may not even know you’re in a fog because that fog has become your ‘normal’. Limited dairy – Cheese tastes delicious. If I was marooned on a desert island, I would probably be fine if I had an endless supply of cheese and sourdough bread. Our bodies do not love cheese or most dairy for that matter. So, your best day ever doesn’t include a lot of cheese or milk or cream. It can include kefir and some greek yogurts. Veggies at every meal – If you focus on the veggies first, the rest of the food falls in line. Aim to get 50% veggies at every meal and then fill in the protein and fats after that. Some delicious grass fed butter (Kerrygold) on most veggies makes them taste amazing or olive oil + salt/pepper + lemon juice? Yum! Healthy fats – Healthy fats often come in the form of a supplement, from fish oil to evening primrose oil to Barleans Total Omega and our brains run off of fats. Unless you’re eating fish daily, you’re probably not getting enough. Get a supplement and start moisturizing your skin from the inside out and helping your mood swings and brain functioning. No sugar – No sugar at all. Ever. Sorry. I know you love it. I love it too. That’s why it’s more addicting than cocaine (really; check the citations at the bottom). Cut out honey too. I want it. You want it. And it just keeps our body dependent on sugar and craving sweets. Supplements – Generally, I’m a fan of getting all of our nutrients from food and, in some cases, this isn’t possible. Some vitamins that we are often low in are Vitamin D (unless you’re in Hawaii or California or Arizona, you’re probably low in D), iron, and B vitamins. You can confirm all of your levels with a test you order yourself here or ask your Doctor to order them. Wheat is not your friend – Gluten free is a trend but really, most gluten free things like gluten free bread or crackers are just substituting one grain for another. The reason wheat is not your friend doesn’t have so much to do with the actual wheat (though the wheat we eat now is not the wheat our grandparents ate!) as much as what the wheat is usually in: pasta, doughnuts, bread and sweets. Try to stick to the ancient grains like farro, amaryth, quinoa and more. They often have amino acids our bodies crave and some building blocks for protein. Community is key – Study after study has shown that community and a close group of friends extends life, makes you happier and even can make you skinnier (or, fatter). Checking with friends helps you reach your goals faster and more consistently too so if you’re starting a new habit, doing it with others makes it easier. Ultimately, my nutrition philosophy is baby steps to better. If you’re eating biscuits and gravy for breakfast, washing it down with coffee and International Delights Creamer and then drinking 3 Diet Cokes and enjoying those breadsticks with lunch and dinner, I won’t ask you to cut everything out cold turkey. We’ll work to change out some of those Cokes for tea or sparkling water, change out the International Delights Creamer for Nutpod + stevia and add some protein for breakfast. If you’re already gluten free, drinking water, and eschew all sugars, then we’ll focus on your lifestyle habits like sleep and meditation. I’m a believer in progress, not perfection. Hi, I want to join this, sounds like just what I need. Where do I sign up? Yay! The “lite” one to give you a feel for the program and introduce you to the comments is here: https://bestdayever.com/collections/challenge-store/products/april-2017-challenge-lite and the full one is here https://bestdayever.com/products/april-2017-challenge I’m super excited to have you in the group. It’s going to be so much fun!